It is one of the biggest games for Israel since Swede Per Carlen took over at the helm of the men's national team in August 2015. After they narrowly missed out in November on the qualification for the World Championship 2017 Play-offs, Israel now face Romania in a double-header on 6 and 10 April for a place in the EHF EURO 2018 Qualification. 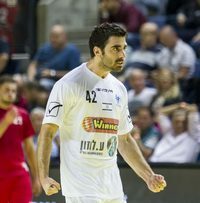 "I came to Israel cause I saw in this mission a great challenge, and I'm working to produce the best and develop Israeli handball. "I hope that this interesting and important project will continue and be enhanced for the future of Israeli handball. However, the upcoming is far from easy as Romania are arguably the strongest team that came to this intermediate play-offs via the first qualification phase, with Luxembourg and Belgium being the other two. Israel have to take this detour en route to the EHF EURO 2018 Qualification because they finished among the three lowest ranked teams in the qualification to the EHF EURO 2016. The last matches between Israel and Romania took place in June 2012 when Israel hosted a first phase qualification tournament for the EHF EURO 2014. Romania won 26:25. For the upcoming double-header the team started its preparation last Sunday, and over this weekend they played games in Luxembourg against the country's national team which they won 33:28 and 33:27. “The main goal is that we step up our game to another level compared to the practice games we played last month in Germany against HSG Wetzlar and TuS Ferndorf. I think the team looks much better than in the last month, in particular with the experience that our returnees Gil Yaakov and Chen Pomerantz bring with the,” says Carlen. The head coach can count on a well-rehearsed group of players as all of them play in the domestic league: Brothers Chen and Gil Pomeranz play for Maccabi Tel Aviv, and so do Vladi Kofman, Omer Davda and Yossi Appo. Dan Tepper, Nivo Levy and Ram Turkenitz play for local rivals Asa Tel Aviv. Amit Stelman, Daniel Friedmann and Tal Gera take to the court for Maccabi Rishon Lezion; Oren Meirovich and Omri Kushmaro play for Hapoel Ashdod, Gil Yaakov and Elad Kappon for Herzlia, Tal Hershkowitz and Sasha Chudnovsky from Hapoel Rishon Lezion – the Israeli champion who won also the Israeli cup last month. Amit Gal represents Ramat Hashron. It is an interesting sidenote to the games against Romania that Israel's goalkeeper coach Alexandru Buligan has been one of the greatest goalkeepers in Romania. In 1984 he won bronze Olympic bronze with the Romanian national team.